eWIT (Empowerment of Women in IT) is a platform to unleash the potential for women and to drive their growth in the IT/ITES industry. Women associated with the IT/ITES industry by education or profession can become a member of EWIT. Awards/Competitions to identify and encourage talents. Consultancy & knowledge-sharing in women-centric policies like gender sensitivity, gender harrassment, anti-sexual harrassment, etc. Academic initiatives via interaction with college students to bridge industry-academia gap. There is an annual membership fee of Rs. 500 for individuals, and there are bulk membership plans for corporate/academic sectors as well. For further information, you can download eWIT’s brochure from here (PDF). 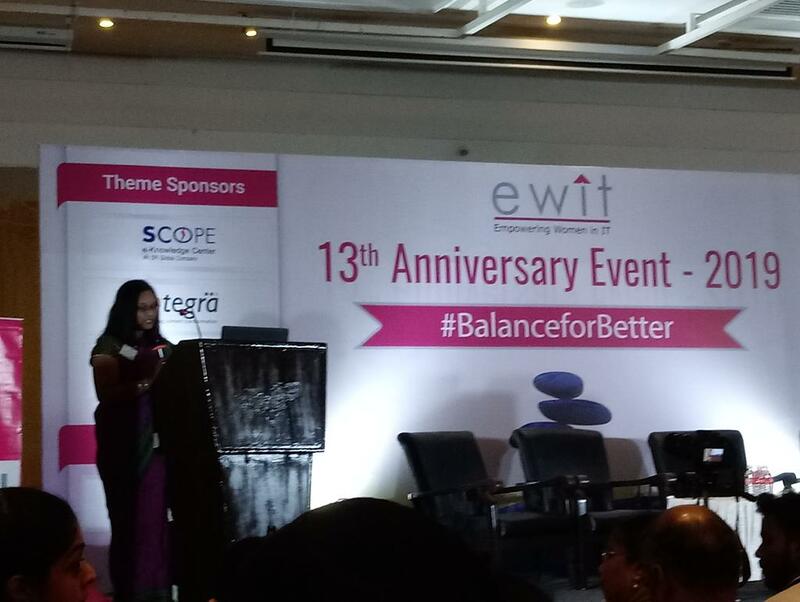 Today I went to eWIT’s 13th Anniversary Event at Hotel Savera, Dr. Radhakrishnan Salai. 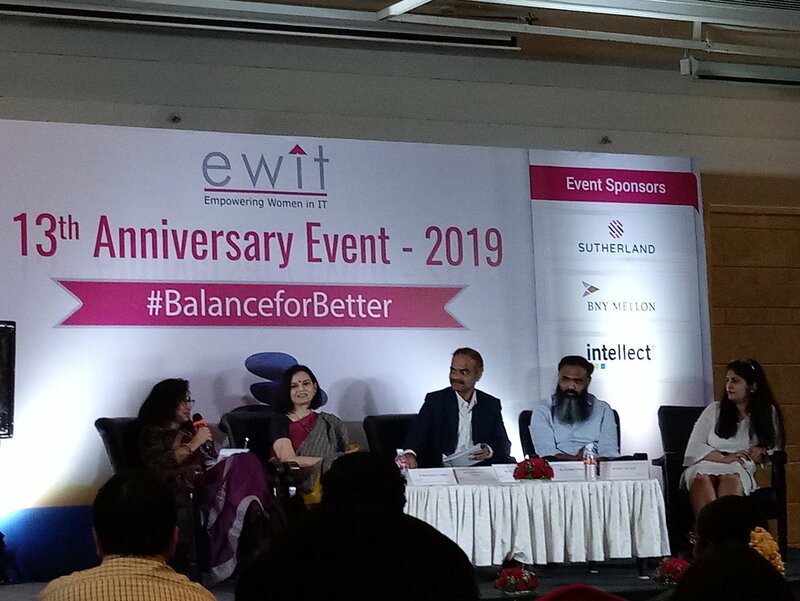 This year’s theme is in accordance with Women’s Day Theme – #BalanceforBetter. I got an invite via our Chennai Bloggers Club by a fellow blogger, Umasree Raghunath. 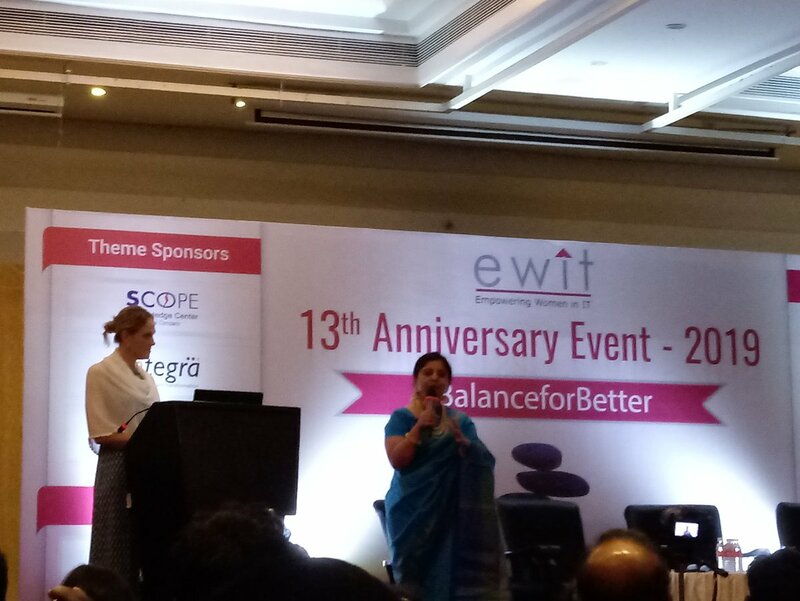 I had already been to eWIT’s 10th Anniversary Event – here are the highlights from then. Shown in the above photo is one of the speakers from this year’s event – Ms. Krithika Swaminathan, Intuit Vice President, Speed and Trust Team. She shared her impressive story of rejecting a job with a leading MNC at Hong Kong as it was a desk job that didn’t suit her personality. And then about her rewarding experience working for the Sultan of Brunei from Jakarta, Indonesia. She told everyone that both Mentors & Sponsors are critical for anyone, especially women, to climb the corporate ladder as Sponsors open doors and have access to decision makers, and mentors help walk through that door. 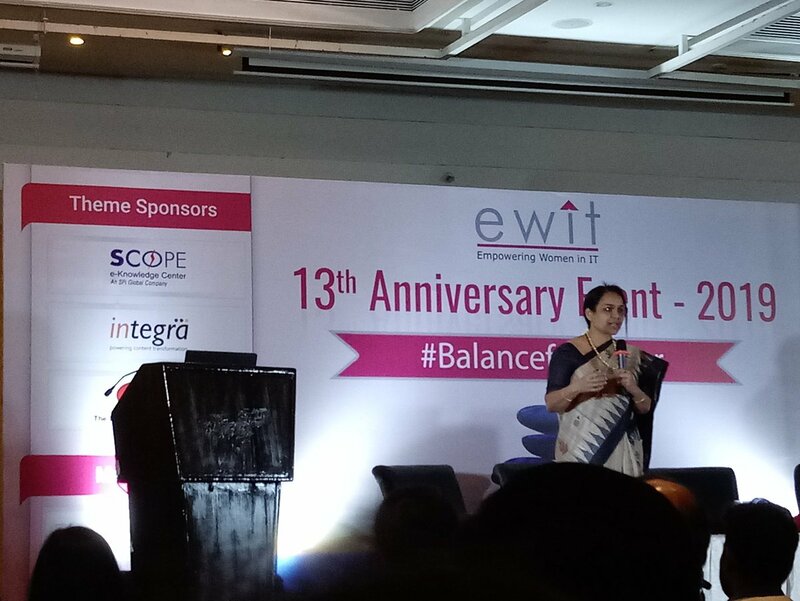 The next speaker was Ms. Bhargavi Nuvvula, Global CIO – Corporate Technology, BNY Mellon Technology. She shared her impressive story of having born in a small village in AP, schooling experience at North India, and then having risen to the position of CIO which she attributes to a vision and positive thoughts. She felt that women need to come out of their self-doubts, be more courageous, and aim high. One of the points she mentioned was how women should not only be problem solvers but should also be conflict seekers, as opportunities sometimes come disguised as conflicts! There was also a panel discussion on how women in IT are making a difference. I liked the points they mentioned about the importance of exercising, becoming a real leader by helping others grow, being strong and initiating change. If you are a woman who is in the IT/ITES industry or who is looking to get into the IT/ITES industry after graduation/taking a break, or in a senior position already and are looking to mentor youngsters, you should look at joining and participating with eWIT.